Despite the Reserve Bank of India (RBI) cutting interest rates by 125 basis points (bps) to 6.75% in 2015, the 10-year benchmark bond yield remains high at the end of the year. (One basis point is one-hundredth of a percentage point.) This is especially true for medium- to long-term securities. “The year has seen a net movement of just about 40 bps against the 125 bps delivered by RBI. The fall in the yields in 2014 was more pronounced," said Ashish Vaidya, executive director and head trading and asset liability management, treasury and markets, DBS Bank India. For instance, the 10-year benchmark yield, which was at 7.88% at the start of 2015, is still high at 7.75%. “Many factors have contributed to bond yields remaining high and one of them has been the demand-supply mismatch," said Puneet Pal, head–fixed income, BNP Paribas Asset Management India Pvt. Ltd. There is, in fact, excess supply in the market, which is pushing yields higher. Despite this the RBI continues to sell bonds in the secondary market at high yields, which has led market participants to lock in yields at higher rates. 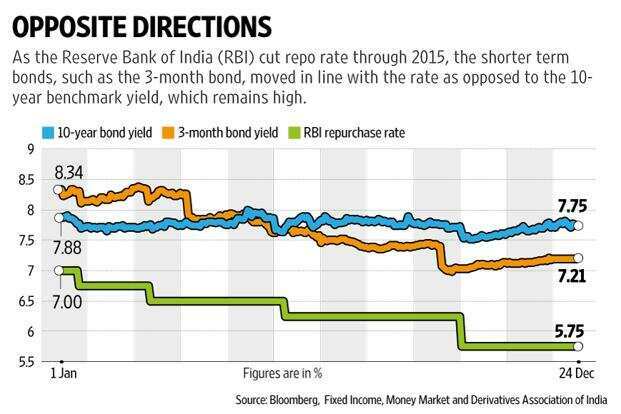 Even the open market operations (OMO) by RBI to buy back bonds, has not been aimed at lowering yields, feel experts. OMO is an activity through which the central bank manages liquidity in the bond market. “RBI is doing this (OMOs) to infuse reserve money into the system. The intention is not really to reduce yields or interfere with the market," said Pal. So, there was little scope for yields to fall. This despite strong appetite by foreign institutional investors (FIIs) for Indian debt. “The FII inflow in the debt market in 2015 was around $8 billion. The wide interest rate margin between global risk-free and Indian gilt, coupled with a relatively strong rupee, saw FII appetite for Indian gilts rise significantly during the year," said Lakshmi Iyer, chief investment officer, debt, and head, products, Kotak Mahindra Asset Management Co. Ltd.
RBI had also announced an additional quota of $2.5 billion for foreign portfolio investors (FPI) to invest in government debt. This quota was to be released in two tranches—in October 2015 and January 2016. But FPIs have already exhausted the quota for this quarter and have started looking at the corporate bond market, which has outperformed the rest of the bond market in 2015. “The corporate bond segment has done well as corporate spreads have come down in addition to the directional move on rates," said Vaidya. The difference in yields on corporate bonds and government bonds is known as spread. “Spreads have narrowed from 55-60 bps to 40 bps in the AAA segment," said Murthy Nagarajan, head–fixed income, Quantum Asset Management Co. Pvt. Ltd. A decrease in spread means that risks associated with highly rated bonds has reduced. One of the reasons is absence of supply in corporate bonds due to a slowdown in investment activities. FIIs have also contributed to the fall in spreads. While they showed strong appetite for Indian debt during the year, they turned net sellers from November, in anticipation of a rate hike by the US Federal Reserve in December. FII outflow from the debt market in November was worth $2,411 billion—the second largest this year. FIIs continued to sell in December as well (Fed raised short-term rates by 25 bps). Yields spiked from 7.5% levels in October to 7.8% now. Another reason for higher yields was the announcement of the 7th Pay Commission. Hike in salaries of central government employees might cost the exchequer more than 1 lakh crore starting next financial year. Due to this, there is a likelihood of fiscal targets being missed next year. Government yields have already moved up in anticipation of this event. In 2015, private placements (non-public offering to select institutional investors) were more than public issues. Data by Prime Database, a primary market tracker, showed that public issue of debt fell from 23,816 crore in 2014 to 6,217 crore in 2015. “The increasing trend of disintermediation largely explains the higher recourse to private placements," said R. Radhakrishnan, head-fixed income, SBI Funds Management Pvt. Ltd. There was little opportunity for retail investors. The yield curve became steeper in 2015 because short-term rates fell faster than long-term rates. A steepening yield curve indicates that the gap between interest rates of securities with short tenure and those with longer tenure, is rising. “This (steepening) resulted in relative outperformance of the belly of the curve (5-10 years) on a risk-adjusted basis," said Dhawal Dalal, executive vice-president and head-fixed income, DSP BlackRock Investment Managers Pvt. Ltd. Long-tenure securities (5-10 years) have given better returns than short tenured ones. Lower yields: Experts believe that 2016 might be better for the Indian debt market if the economy improves, and inflation remains low. Yields are likely to see a downward trend but remain range bound. The yield curve is expected to remain steep, at least in the first half. Market participants say that the supply of bonds will remain and the rate curve will likely steepen, which will be good for the economy. “A steeper curve is a harbinger of economic revival and enables banks to borrow money at the short-end of the curve, and lend money on the long-end profitably," said Dalal. But there are chances of the curve flattening in the second half. “Longer-term rates may fall faster than short-term rates," said Avnish Jain, head-fixed income, Canara Robeco Asset Management Co. Ltd.
More corporate instruments: With economic revival, corporate spreads might move up in 2016. “The spread between AAA-rated public sector undertaking bonds and government securities is excepted to increase to 60-80 bps in the next financial year," said Nagarajan. Corporate issuances would go up, giving investors an opportunity to buy in the corporate bond market. Furthermore, said Vaidya, as FII investment limit in gilts gets enhanced, and the dollar’s upward rate trajectory starts, there might be lesser buying interest from FIIs in the corporate bonds space. Given this situation, investors can expect more corporate instruments to invest in. However, while the case for corporate bonds is strong in 2016, it is important to look at only highly rated securities. Mint prefers AAA-rated securities. Fewer tax-free bonds: Issuance of tax-free bonds might come down. “The challenging fiscal consolidation roadmap over the next two years might mean lower or no issuances of tax-free bonds given the backdrop of modest gains in direct taxes," said Radhakrishnan. The government usually announces limits for tax-free bonds in the annual budget. Since the fiscal deficit target looks tough to achieve, there may be little provision for such bonds next year. Inflation and small savings should not be ignored: Even though things look optimistic, a lot is riding on how inflation and small savings pan out in 2016. “Consumer price index (CPI) based inflation is expected to average higher than in the current fiscal. The movement in CPI should have a larger bearing on bond yields compared to movement of the rupee," said Radhakrishnan. Small savings rate, up for revision in April 2016, would also have an impact. A cut would enable banks to cut deposit rates. Investors should keep track of these points before investing in the debt market. Invest only in highly rated securities as the credit risk has gone up in the past year due to slower drop in lending rates. Also, senior citizens could try to lock in rates for the long term as interest rates are expected to fall further. Watch out for small savings rate change in April 2016 to check if these rates are higher than other debt instruments. Always make your investments goal-based so that you do not invest too much or too little in debt instruments.